Why I usually only profile one book on this blog, today I am going to be ambitious and not only profile an entire series, but two. 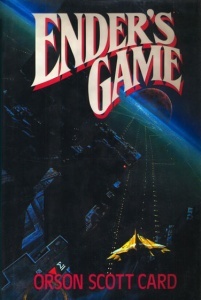 I started reading the first Ender Series book, Ender’s Game, with what can only be described as apprehension. I knew what the plot was and it seemed rather cheap to me. After two hours in, I am proud to say that I was gravely mistaken. The plot is not only very memorable, but the characters just stick out in your mind. The world Mr. Card builds through the story is also very thought provoking. The premise of the main story in the first and most famous book Ender’s Game, is that in the future the world has been twice attacked by an alien enemy known as the Formics, better known through the derogatory term “Buggers”. The Formics are an insect race which are controlled by “Queens” much in the same way ants are. The Formic’s second attack was only just overcome by the combined force of Earth’s many nations. However, despite Earth’s victory the Formics have never been truly defeated outside the Sol Galaxy. To combat this overarching threat the nations of Earth operate a military force known as the International Fleet (IF). The IF institutes a program where extremely gifted children from around the world are collected and sent to the IF’s Battle School to be trained to be the planet’s most gifted military geniuses to lead the Fleet against the Formic threat. The Battle School is located in an orbiting space station far above the Earth. Enter Andrew “Ender” Wiggen, the youngest child of an American Family. The IF takes a peculiar interest in Ender and soon Ender is on his way to the Battle School. Once there he makes many friends and enemies. The students at the Battle School are broken into 41 teams which battle each other in a null gravity room. In this null gravity room the teams act as armies in mock wars and use various tactics to beat one another. After being passed among several teams, Ender is eventually given a team of his own to command. He quickly conquers the other teams to become the battle station’s top commander. Eventually he and his top commanders are taken from the Battle School to Eros were the fight against computer controlled enemies with mock fleets of ships. Eventually Ender beats the simulated enemy and eradicates the enemy’s home planet. At this point it is revealed that the mock war wasn’t a simulation. It was a real war against the Formics that Ender won by completely destroying the Formic Homeworld. Due to the stress from the pressure put on him as well as the guilt at having committed Xenocide (the complete destruction of an entire alien race), Ender temporarily snaps. After the war, he goes of to help build humanity’s first off world colony. Once there he find the last surviving Formic Queen, through her, Ender learns that the Formics didn’t mean to ever interfere in human affairs ever again and regretted the first two wars they started. The third war was started and ended by the Humans. To help redeem himself, Ender agrees to help find the Formic Queen a new home to restart her race. This sets the stage for the rest of the Ender’s Game Saga. The Ender’s Shadow series deals with the world Ender Leaves behind and how his fellow students from the Battle School deal with their return to Earth. Their return causes many political intrigues to be played out which often result in all out war between countries who use the Battle School students to plan ingenious military plans in an attempt for global Hegemony. Where the Ender’s Game Saga is very spiritual in nature the Ender’s Shadow Saga is much more political in nature. Throughout both series, Card creates a world that is exceptionally similar to our own, while at the same time very different. For example, while the countries are unofficially united against the alien threat, much bickering still happens between nations. Also the technology, past the spaceships and interstellar travel doesn’t seem to be so different from our own. Tablets seem to be much more commonplace in this world than our own, however. What really get’s me about these two series are the themes that Card manages to explore with his characters. Besides the usual war and politics of most sci-fi stories, Card also manages to explore such themes as Sibling Rivalry, Collective Guilt, Child Labor, as well as the Concept of Necessary Evil. What get to me most about these stories is how Card manages to get you genuinely love each and every character. When A character achieves joy, the reader experiences it with them, when a character feel pain, the reader feels that as well. The events in every story also keeps the reader in a constant state of wonder and an eagerness to figure out how the characters will solve the problems they will encounter. On a special note, what I found especially interesting in this novel was the many instances that Catholicism plays a part in the stories. Many of the characters are either practicing Catholics or have a Catholic past. Now to many this may not be an issue, but I find this interesting as Orson Scott Card is a Mormon, and high in the Church at that. Now please don’t get me wrong. I have nothing against Mormons or their faith. I am, however, almost certain that Catholicism is a major symbol in the stories, but for the life of me I cannot figure out what the symbol is. I find this to be one of the most intriguing aspects of the novels. I would love to hear any and all ideas on this as well. Needless to say that I am very excited for the Movie verions of Ender’s Game to premier later this year (trailer shown here: http://www.youtube.com/watch?v=vP0cUBi4hwE) and I will post a review of it whenI finally get to see it. I suggest these novels to anyone and everyone who can read them. They have something for everyone and they will genuinly make you think.